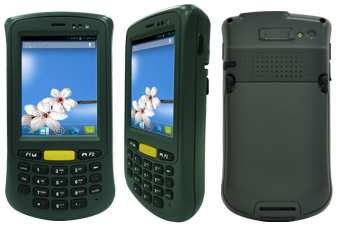 After releasing E430M2 (4.3" Rugged PDA), Winmate designed the successive 3.5" version of rugged PDA, C350M2, which runs Android 4.1. The C350M2 model actually represents the second generation of the platform. A 1GHz dual-core Cortex A9 processor has replaced the TI DM3730 chip of the original version. Users now get 4GB of storage via micro SD card (and optionally up to 32GB). Onboard WiFi has been upgraded to 802.11 a/b/g/n for maximum wireless communication. Most importantly, the new C350M2 is based on Android 4.1 ("Jelly Bean"), which offers full dual-core support as well as numerous technical improvements over Android 2.3.4 ("Ginger Bread") used in the older version. As in prior versions, the C350M2 provides a good old-fashioned Pocket PC form factors. Building on the overall design of the C350T series, this new model remains completely compatible with all prior peripherals, including barcode (1D/2D) or RFID readers (HF, 13.56MHz). The device includes a 5-megapixel rear documentation camera with illumination LED. C350M2 is a tool for a job and it is rated at 440 nits (for Resistive Touch) or 280 nits (for P-Cap Touch), these two different models can be used under different circumstances to meet users’ needs. On the ruggedness side, all Winmate Handheld Series devices are designed to be used in harsh environments. The C350M2 offers IP65 sealing (it is a lot tougher than previous model), a 1.2-meter drop specification, and a -10 to 50 degree Celsius operating temperature range to allow the device to be used in any harsh environment.